Those familiar with the Hammerton aesthetic are well aware of our passion for transforming common materials into uncommon lighting designs. 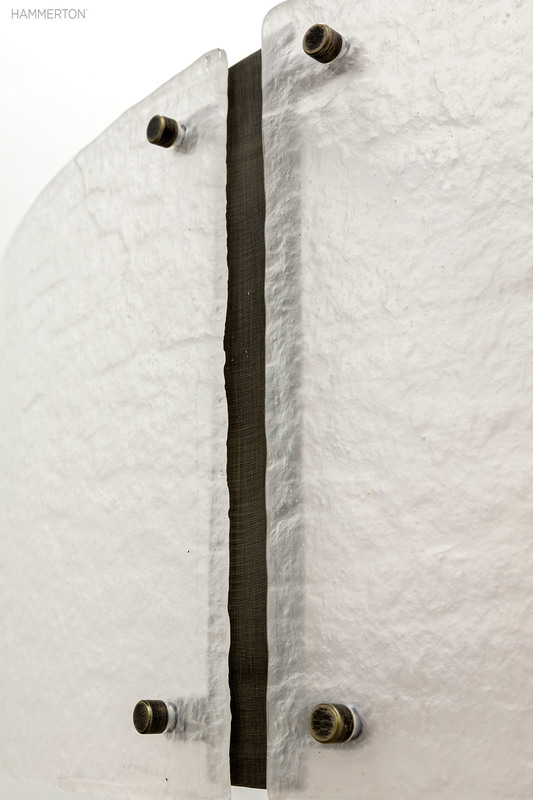 Think heavy gauge steel, blown and kiln glass, industrial mesh, and so on. So it's no surprise that our design team took a similar approach with basic sheet glass -- and the result is Hammerton Chiseled Glass, currently offered in the pendant, linear suspension and sconce shown below. When light is allowed to bounce off and through irregular surfaces, magic happens. Here, it appears to twinkle as it refracts through multiple layers of hand-hewn glass. Each fixture features 93+ CRI integrated LED that's dimmable to 1% and available in either 2,700K or 3,000K color temperature. 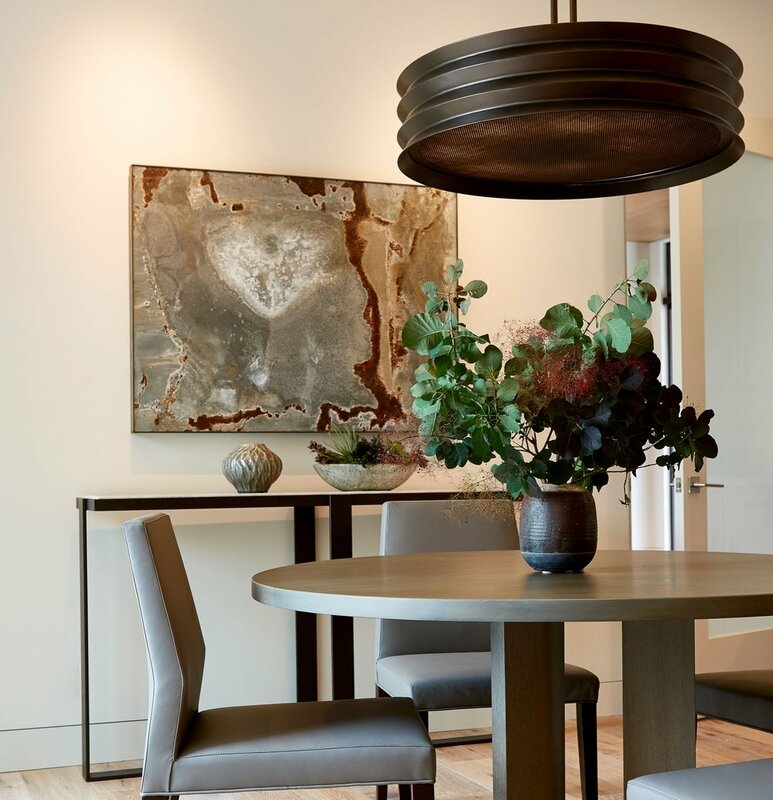 Above: contemporary pendant LA2304, 16"H, shown in Flat Bronze opaque finish. Like all Chiseled Glass fixtures, it's offered in a choice of over 20 finishes. Above and below: contemporary linear suspension PL2291, 51"W, shown as 30"H in Satin Nickel translucent finish. 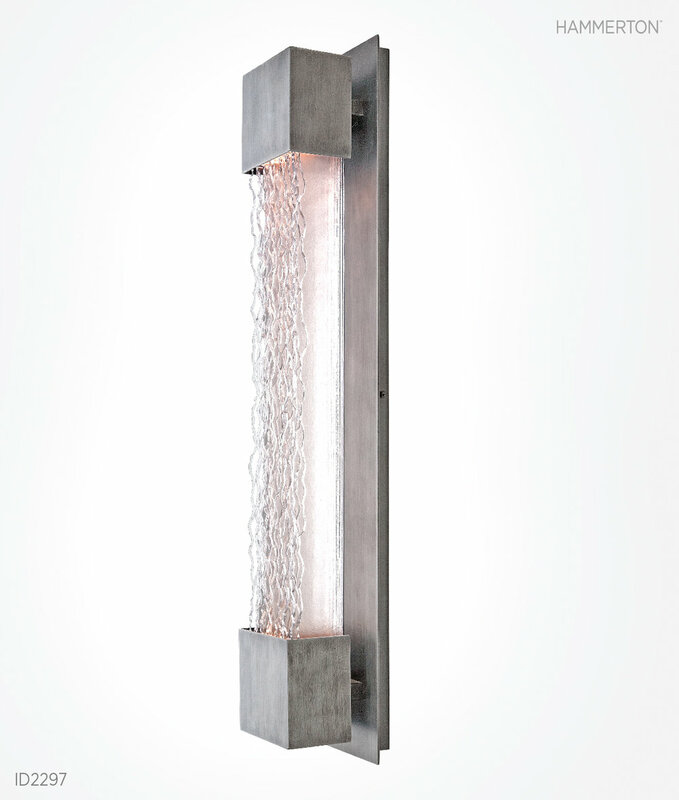 Below, Contemporary indoor sconce ID2297, 32"H, shown in Dark Nickel finish. 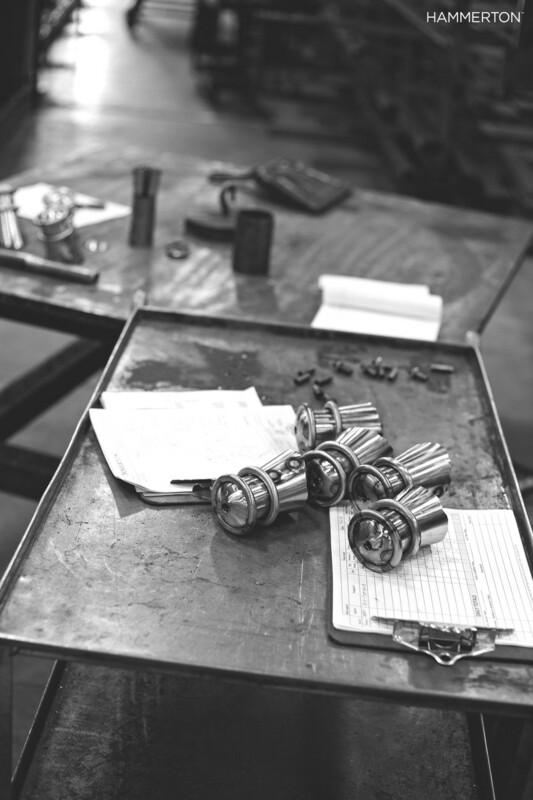 Click on any product image to see complete product specifications, or call your Hammerton representative to learn more. Nature has given us a visual smorgasbord of shapes, colors and textures from which to draw inspiration. At Hammerton, we transform these visual elements into functional works of art. Hand-forged and sculpted aspen, maple and oak leaves, grapes, acorns, pine cones, boughs and more adorn realistic bark-covered branches meticulously fabricated from steel. Rich color elements are introduced in hand-applied finishes and complementary shade materials -- like the magenta bell-shaped flowers in the chandelier below left. Rawhide and mica are other popular lens materials and merge with a myriad of nature-inspired elements, from intricately detailed aspen branches to wildlife such as elk and moose. Take a look at a few of our recent and favorite organic custom creations here. Above: Two very different wine cellar fixtures, both with grape motif details. The cascading chandelier at left (and below) reinterprets a tangled grapevine adorned with hand-blown and scallop-edged flowers, while the old world design at right consigns a simple yet beautifully detailed finial to acknowledge the fixture's intended purpose. Above: three dome fixtures demonstrate a variety of organic styles ranging from realistic to interpretive. Although the one at left is fabricated from steel, every element is realistically crafted to look as if it was hand-hewn from a pine tree. Decorative aspen leaves, a rawhide dome and dark mica diffuser add organic warmth to the European-style dome design in the middle, while the fixture at right deploys windswept 'twigs' of hand-forged steel to enhance the fused crystal glass dome. Above, the signature fixture of the Lucky H Bar & Grille in Salt Lake City's award-winning Little America hotel. This 25-ft diameter fixture is constructed from five sculpted steel branches, each over 10 feet in length. Above, the organic sconce design also featured in the Lucky H Bar & Grille. Shown above are two of our favorite custom designs featuring multiple wildlife motifs. The fixture at left was conceived for the Louisiana Bayou home of an avid fisherman and duck hunter. 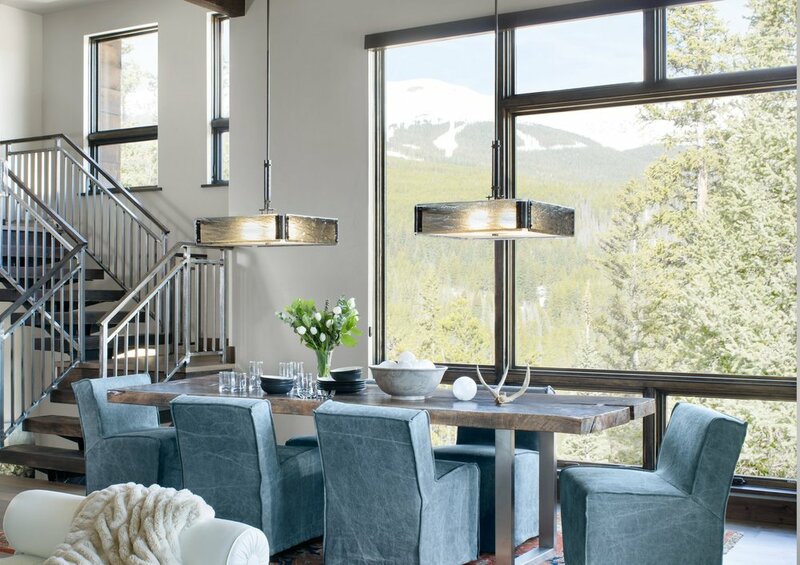 The fixture at right is a popular catalog design that has been modified to incorporate four sculpted moose heads for a large Montana residence. Above and below: unique kitchen pendants sculpted from steel and clear thick-walled blown glass shades. The dramatic custom organic motif complements the bold finishes and natural tones in the surrounding space. Two very different organic-inspired approaches to the traditional pool table fixture. At left, a traditional rawhide shade adorned with pine cones and boughs. At right, a spray of oak leaves adds organic warmth to an old-world inspired design showcasing scrollwork and dark art glass shades. Above: the realistic pine needles and cones, branches and bark-like surfaces of these two ceiling lights -- all meticulously hand-sculpted from steel - highlight the remarkable artistry of our fabrication team. Above: two kitchen island fixtures with silhouette diffusers depicting natural landscape scenery. Each silhouette element -- from the evergreen boughs to the elk's beard -- is detailed by hand. Above, two oversized entry pendants featuring a pine motif. The lantern style pendant at left has a dark mica lens, while the fixture at right has a rawhide lens. Note in particular the realistic bark-like detail on the center band of the right hand fixture. Summer is the time for outdoor gatherings with family and friends, and there is no better way to show off distinctive outdoor spaces than with custom outdoor fixtures from Hammerton. Whether your project calls for a particular function, style, scale, motif, lamping or other unique requirement, we can accommodate your needs. Learn more about our capabilities by reviewing a few recent and favorite projects below. Created for the L'Auberge du Lac resort in Lake Charles, Louisiana, this dramatic large scale chandelier is designed and engineered to be weatherproof, lightweight and maintenance free. Key features include aluminum construction, LED lamping, and an AAMA-2604 rated finish that provides the highest standard for UV and corrosion resistance -- an important requirement in the hot, humid and salty air of the Gulf Coast climate. Two examples of custom old-world European designs that shipped in the last several weeks. At left: the outdoor sconce design for a large retreat overlooking Lake Tahoe. At right: the outdoor sconce design for an oceanfront villa in Palm Beach, Florida, fabricated in aluminum, marine grade pre-treated and coated with an AAMA-2604 finish to resist UV damage and the corrosively salty Florida air. Two outdoor fixtures from a collection of 17 custom designs completed last month for a New England coastal estate. Brass pins, strapping and schoolhouse-style glass are elevated to decorative details in this nautical interpretation of Craftsman-style lighting. Located on over 2,000 sweeping acres between North Lake Tahoe and Truckee, California, Martis Camp is a private gated community that embraces the true essence of High Sierra living. Swaback Partners collaborated with Hammerton in designing a signature collection of unique outdoor fixtures that complemented the award-winning architecture and breathtaking natural surroundings. A double drum porte cochere chandelier for a magnificent estate currently under construction in Ontario, Canada. 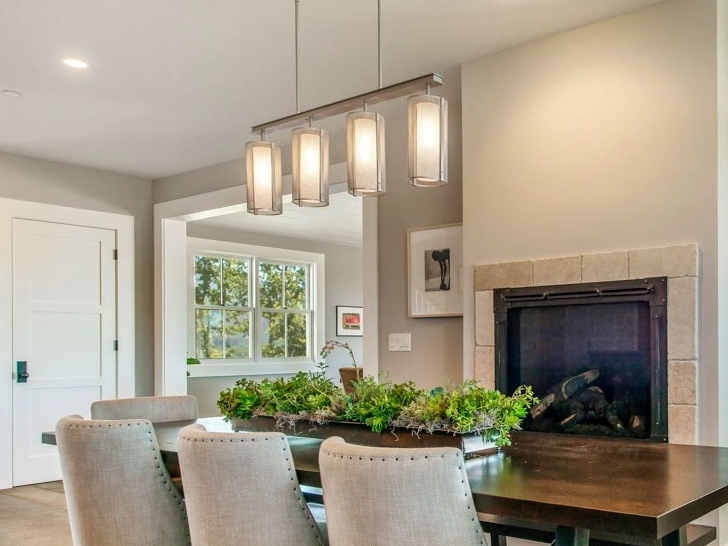 Similar design elements are repeated in over 30 additional custom fixtures being installed throughout the home. Completed in late 2015, High Star Ranch is a mixed-use destination resort in the rural foothills of Utah's majestic Uinta mountains. Hammerton designed and built both the interior and exterior lighting packages for High Star's 10,000 ft DeJoria Conference Center. Woven mesh featured throughout the exterior lighting package gives a utilitarian nod to the surrounding farming community, while contemporary fixture forms allow the scenic landscape to take center stage. Two examples of recent custom post mount designs that are modified versions of outdoor products in the Hammerton catalog. Three custom outdoor fixtures recently out of the shop. Over 300 of the far right fixture were fabricated for the remodel of a Four Seasons resort in Hawaii, where rugged climate conditions not only include UV and humidity but unusually corrosive air due to the tropical location and constant presence of volcanic ash.